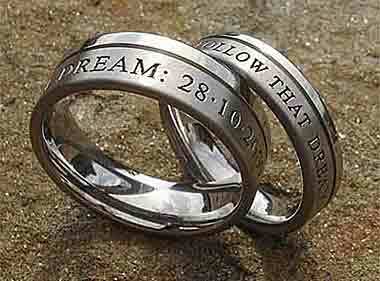 ENGRAVED TITANIUM RINGS : LOVE2HAVE in the UK! 8mm width flat profile engraved hearts wedding ring in twin finish titanium. Domed profile wedding ring available in two widths made from twin finished titanium with a personalised outer engraving. Flat profile wedding ring available in various widths made from twin finished titanium with a personalised outer engraving. Flat profile wedding ring available in various widths made from titanium with a personalised outer engraving. Flat profile wedding ring available in various widths made from two-tone titanium with a personalised outer engraving. Flat profile wedding ring available in various widths made from twin finish titanium with a personalised outer engraving. The BEST! Quality engraved titanium rings all made here in the UK. We have a range of exciting and dynamic designs at affordable prices, and our laser engraved titanium rings are the most exciting and innovative of all the collections of rings we sell. Cutting-edge technology is used to produce this dynamic and diverse range of titanium rings for men and women, and as you can see the images speak for themselves. This technology can create very intricate patterns and also more understated decorative styles in the form of simple personalised messages on both the inner and outer parts of any ring - perfect for your custom wedding rings or any other special occasion. The decorative patterns are all created by the laser burning into the titanium which leaves a deep engraving. If you look closely at the images, you will spot a pitted textured surface where the laser has come into contact with the titanium. The pitting creates a darker area due to the way the light catches it which adds a higher definition to the pattern. On a final note we are very confident in that not only do we provide the BEST engraved titanium rings made here in the UK (and probably the world) but also at the LOWEST PRICES too. If you think you may have seen the same decorative titanium ring elsewhere at a lower price, let us know, and we will price match like for like. YES! We can BEAT anyone!